Carson City officials expect to take on a range of complex issues in 2018. A new waste management contract is on the horizon and could change how the city recycles. A new formula for stormwater rates is being considered to more equitably distribute costs. And major road projects are underway as the city, like cities and counties everywhere, continues to struggle with how to pay for routine upkeep of its streets. Probably no issue is more complicated than housing, which should be front and center in the coming year. As anyone who has looked for an apartment to rent or a house to buy in the last year can attest, Carson City’s housing problems run the gamut. “The market is 100 percent occupied,” said Jeni Chavez, director of Rental and Housing Programs, Nevada Rural Housing Authority. NRHA just completed a statewide housing study. In Carson City, the group found a need for 1,350 new rental units. Those include 425 units at market rate, 270 units for workforce housing serving families of four making between $31,000 and $50,000, and 653 units at subsidized or affordable rates for families making under $31,000. The city has two housing task forces working on the problem and housing will be a topic at the supervisors annual retreat in February. Also this month, the Planning Commission will look at new capacity planning analysis by the Public Works department as part of its annual master plan review, which could result in recommending the Board of Supervisors change some zoning in the city to accommodate more housing. There’s development, but in various stages. Single-family homes continue to go up in Schulz Ranch and Silver Oak. 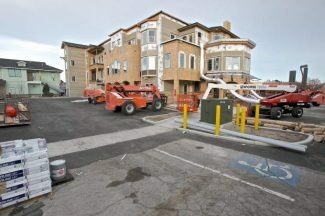 Construction is again underway at Jackson Village, a 41-unit single-family home development that had been dormant for more than a year. Developments of lower-priced, single-family attached homes are in the early stages, including Arbor Villas, 147 townhouses on Little Lane, and Mills Landings, a 105-unit project on State Street. Multifamily projects are in the works, too, including The Villas at Silver Oak, a 150-unit project on G.S. Richards Boulevard, and Carson Hills Apartments, a 300-unit complex planned on Curry Street, which are both in early stages of development. Apartments as well as single-family houses are planned on Lompa Ranch, too, but the land needs considerable site improvements, which haven’t started. An affordable housing development known as the Brown Street project is stalled. NRHA has been working with the city to move the project forward, but has run into roadblocks acquiring needed properties in the area. “2018 going to be a year of land acquisition and planning,” said Jack White, JL White and Associates, the Houston consultant that helped conduct the NRHA housing study. In 2018, Carson City continues its downtown revitalization project with Curry Street. The street and side streets — from Robinson to Musser streets as well as the alleyway between Spear and Telegraph streets — will be dug up, water lines replaced, electrical utilities put underground, and repaved. The $3.22 million project is the second phase of work that started on Carson Street and will be done by the same contractor, Q&D Construction Inc. The design is nearly complete and construction should start in April and be completed by August, said Dan Stucky, city engineer. The remainder of Carson Street, south of 5th street to the I-580 bypass, will be on the drawing board in 2018 with construction slated to start in 2019. The design is being done in house by Public Works staff based on one of two conceptual designs by consultant Kimley Horn that was overwhelmingly preferred by citizens who attended an open house in March. The initial design work was funded by the Carson Area Metropolitan Planning Organization (CAMPO). The design will narrow the road to two lanes in each direction with a center turn lane and add a multi-use path for bicyclists and pedestrians on the east side of the road. Some details, such as a roundabout at Colorado Street as well as the size of the project, are still to be determined. Most of it is being funded by $5.1 million from the Nevada Department of Transportation, which is in the process of transferring the road to the city, but Carson City is still waiting to hear if it will receive an $8 million Transportation Investment Generating Economic Recovery grant from the federal government to fund the portion between 5th Street and Fairview Drive. Fairview Drive between Carson and Roop streets may be reconstructed in 2018 with an unexpected $650,000 from NDOT, money the city was supposed to receive in 2020. The decision how to spend the money could be made at the January CAMPO meeting, said Lucia Maloney, transportation manager. Other road projects include redoing 2.5 miles of Sierra Vista Lane and reconstruction of Silver Sage Drive from Clearview Drive to Roland Street. And the rehab project at the Water Recovery Resource Facility enters its second phase in 2018. It goes out to bid in the spring with construction expected to start in the summer and continue through 2019. The $9.7 million project will replace some more aging equipment and cover the headworks where the wastewater enters the plant to eliminate odor. The wastewater treatment project was funded with bonds made possible by a hike in water and sewer rates. Now, the city plans to tackle stormwater rates. An across the board 30 percent hike was recently implemented to fund $4.87 million in bonds for storm drainage projects. But that was considered a short-term fix while the city conducts a rate study to overhaul the entire rate structure. The city will also spend the year focused on its next waste management contract. The current contract with Waste Management Inc., expires in 2019 and the city would like to move to single-stream recycling, if possible. The city has hired a consultant to come up with a list of options for services that will be used to write the request for proposal. That’s a heavy lift to get public support because something like 20 percent of people in Carson City don’t use waste management services. But City Manager Nick Marano says mandatory pickup could lower everyone’s costs. “If you look at Reno or Sparks, we pay a higher rate and part of that is that the other cities have mandatory pickup,” said Marano. Marano argues taking your trash to the landfill can be as costly as paying for the service. And there are those who skirt the law and dump illegally, creating what Marano says is the one of the most common code complaints.